Patrick sent in this report about the Ventana El Gran Jefe Tandem Fat-bike that Alex at MTB Tandems built for he and his wife Gabrielle. 95% of my cycling is on a tandem with my wife. We’ve been wanting to extend our cycling season into winter here in Iowa so we’ve been watching all the fat tandem experiments online the past couple of years. 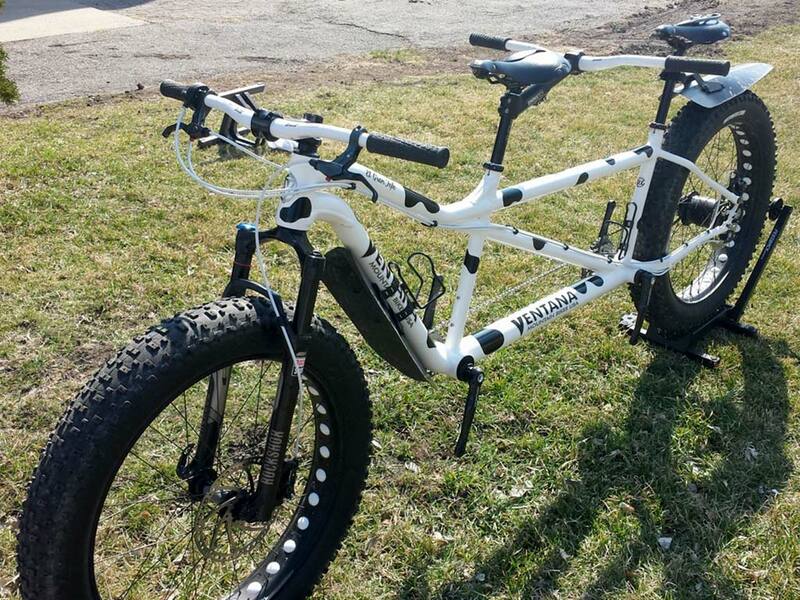 We’ve looked at the initial homemade fat bikes. We saw the prototypes by Santana and the Sandman. We looked closely at Quiring as they appeared to be the first to actually offer a production fat tandem frame, but there were some things about it we didn’t like. There is a cool picture of a purple Fatbike Salamander on the web, but we couldn’t find any information about actually purchasing one. Then one day I was looking at the MTB Tandems website and I saw they were offering a Fat Tandem by Ventana. However, he didn’t have any pictures and he had very limited information about it. I went to the Ventana website and there was zero information about a fat tandem on their website. So I called Alex Nut at MTB Tandems and asked, “What’s the deal on this FAT Ventana Tandem”. I said, “you claim to offer one, but have no pictures and Ventana doesn’t seem to know anything about it either”. lol. He told me that he had been pestering Ventana to build one for a couple of years. He promised them he would sell a bunch of them he said they finally agreed, but so far he had only sold one order. It comes in orange or green, but we paid an extra $150 for custom white paint (we added the custom black cow spots later). This was November 2014 and Ventana had not yet actually produced a frame yet. He said they were scheduled to build the first frame in a month or so. All he knew was that it was going to be modeled after the El Gordo and he sent me a sketch of the prototype. I told him we’d take the second one. We paid a $1,000 deposit and placed our order. The bike took longer to finish than expected due to delays at Ventana and we didn’t get it until March. We only got a couple of snow rides in before winter ended, but our initial experience on the snow was that it was very fun and the bike handled surprisingly well. We put the VeeRubber Snowshoe on it. Here is a video of our first tiny little test ride around the neighborhood. We decided on the Rolloff build rather than standard 1×10 because riding in snow and gravel is messy and we liked the idea of a sealed drivetrain. We REALLY like the Rolloff, but it did take some getting used to. It does not shift well or at all under tension so I had to get better about communicating shifts. It is really nice in snow because if you suddenly find yourself in deep you can slam 4, 5, 6 gears instantly. Or if you have to stop suddenly while in a larger gear, you simply twist the grip and you are back in first gear and ready for take off. It’s great! We’ve always wanted to ride gravel on our tandem because we have lots of rides here in Iowa on gravel and lots of our friends ride it. We had tried to put some wider tires on our touring tandem, but even with a bit wider tire we never felt comfortable riding our tandem on gravel. If it was hard packed it was ok, but as soon as there was any loose gravel or if you had to move to the side of the road for a car it was very hard to control the bike, you’d sink in, the wife would get scared and quit pedaling and we just didn’t like it. We thought about buying a standard mountain tandem, but we knew it wouldn’t give us the snow riding option so we thought Fat Tandem would be the bet of both worlds for us. This Spring we pulled the big knobbies off and put on a set of VeeRubber 3.5 Speeders and did a 60-mile gravel race “The Gents Race”. We were AMAZED at how this bike road on gravel. There was some deep loose gravel on this course and we literally floated right over the top. This was the first time ever that we felt comfortable bombing hills and riding gravel as hard as our legs would carry us. It was glorious! Here is a second video out riding gravel and snow with some other fat-bike buddies and BOMBING down gravel hills. We’ve been riding our Jefe since March, built it up in advance of a Spring Break trip to Fruita/GJ and Moab. We rode a Fandango 29er for a few years before jumping to fat tires. We have three sets of wheels 26 x 4, 27.5 x 3, 29 x 3. We have a fat tandem, too, but ours is a custom built by Rogue Cycle Works here in Grand Rapids, MI. I want to echo your feelings about the fun factor in the winter and the confidence on the gravel – my wife and I feel the same way! The only comment I’d add about snow riding is that if the snow gets really deep, we sink in and can’t ride unless the snow is packed hard. So we find ourselves choosing either groomed, packed trails or gravel roads in the winter time. I would like to know about your experience with your Bluto fork. We have a rigid, but I’d like to switch to squishy because I find that I take a pounding when the trail gets rough, even at low tire pressures. Is the Bluto up to the tandem rider weight? Does it work when the temps get cold? I’d appreciate your advice. Lastly, if you find yourselves in the west Michigan area, we’d love to get together and ride! Following up . . . I bought and installed a Bluto on our fat tandem. Wow! What a difference! The riding dynamic is 100% improved! No more hand, wrist, elbow pain for the captain and the bike rides great! I had read your post after coming across the El Jeffe on my own. I just don’t have the $$ for it, even though it’s actually a great value! Fat tandems are a blast!